The Miami Yacht Show was an important moment for Overmarine, first for the new collaboration with MarineMax, and but also for the presentation of the future new flagship of the Italian shipyard, the Mangusta 205. Few details are known for the moment, but these first renderings by Overmarine give readers a good idea of this future giant. She will be the largest Open superyacht ever built the yard with a length of 62.50m. Her exterior design follows in the same spirit created by Stefano Righini: low and agressive lines, with spectacular exterior areas, especially in this version, with a beach club at the stern, lounges, solarium and a pool on the foredeck and a large sundeck. Note the presence of a crows nest on the radar arch as a helm station. Inside, the Mangusta 205 will accommodate 12 guests and 12 crew, but multiple other layouts are possible. Looking at the profile, there are large, long portholes below the foredeck. 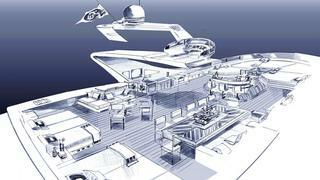 That's the future position of the owner's suite, atypical for an Open superyacht. On the technical side, the Mangusta 205 will be powered by triple MTU engines with KaMeWa waterjets giving a top speed exceeding 30 knots. Construction of the Mangusta 205 should start soon, and we'll keep you updated about the future of this impressive project.